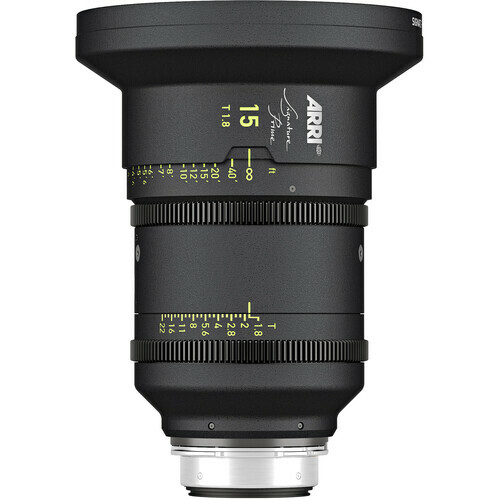 The 15mm ARRI Signature Prime T1.8 (Feet) is a wide-angle lens in an array of large-format primes featuring organic images, attractive bokeh, and a fast T1.8 aperture for achieving shallow depth of field. This prime lens gently softens the large-format look, and produces pleasant, natural skin tones. Focus falls off smoothly, highlighting your subject against its background frame. This LPL-mount lens features ARRI LDS-2 lens-data compatibility for speedy lens setups, and high lens metadata rates. Designed for use with full-frame, large-format sensors, the versatile ARRI Signature Primes also cover Super 35. Dedicated LF Open Gate, and Super 35 Open Gate magnetic format masks enable you to switch between formats, and are included with the lens. Stockings, nets, and voile can be used for diffusion when mounted in the Signature Prime's rear net holder. Eleven iris blades produce smooth, rounded bokeh effects, and a telecentric design minimizes breathing. The LDS-2 lens data system is backwards-compatible with ARRI's LDS-1, and communicates with Cooke's /i Technology. Constructed with magnesium housings and aluminum gear rings, each Signature Prime is lightweight, water-resistant, and features focus marks in feet. Anti-reflective coatings, light baffles, and light traps help to minimize any internal barrel flare. Should a stunt go awry, or your camera rig be otherwise damaged, the front and rear lens elements of the lens are easily replaceable at an ARRI service center.